BIG & Juicy for RM2! Be the first 100 customers through Carl's Jr. 1 Utama Shopping Centre outlet doors to get a Famous Star With Cheese or Buttermilk Ranch Hand Breaded Chicken Tender Sandwich at RM2 only! 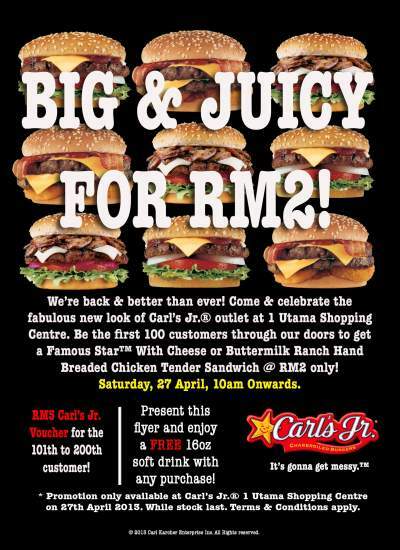 Apart from that, RM5 Cash Voucher will be given away to the 101st to 200th customers. What's more, present this flyer to get a FREE 16oz Soft Drink with any purchase.